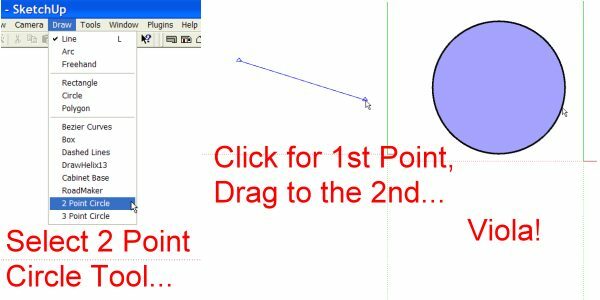 description Create a 2D circle by specifying the diameter end points. The circle will directly face the Camera. Left Click on any 2 points. The circle will be created. At any time, you can enter the number of segments in the VCB. If the segment value you enter cannot be interpreted to be some type of valid number, you will hear a beep and the old value will be restored. If you don't want the circle to have a face, press UNDO immediately after the circle is created and the face will disappear. You don't have to reselect the tool if you want to draw multiple circles. Just keep clicking away. The behavior of this tool may seem strange a first, but here is how it works. First, the radius is picked at 1/2 the distance between the first point and the second point. If you have picked two points on the same flat plane, the circle will be drawn to the size that you would expect. However, if you point one point in the foreground and the other in the background, the 3D distance between the two points is used, not the 2D distance as you are viewing the point flat on the screen. Second, the center of the circle is picked at the midpoint of the diameter line you drew. Finally, the vector of the circle will face the camera. Therefore, to use this drawing tool in a predictable manner, go into an ortho view, and even consider turning perspective off. Note: since SU's circles are not really circles, but faceted edges, there is no guarantee that the edges of the circle will exactly align with your points. The circle is defined correctly.